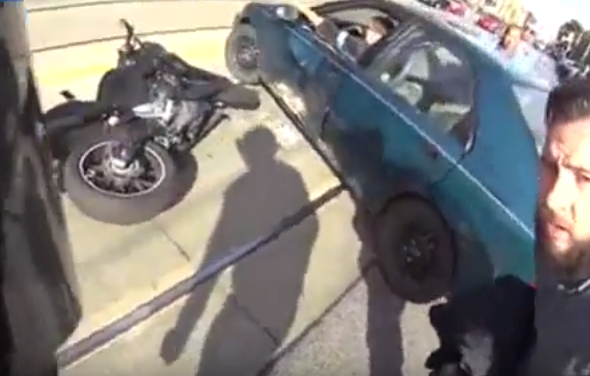 An unlucky biker catches the moment he was thrown from his bike by a careless motorist. The American rider managed to film the crash on his helmet-camera, showing the car pulling blindly into his path. Nobody was injured, but both bike and car took major damage, with the driver-side window shattering from the collision. The motorcyclist is seen making his way along the parade of shops before a parked car moves into the road to perform a U-turn, causing an unavoidable collision. The rider appears safe travelling along the tram-lines on a wide traffic-free street, however as he momentarily takes his eyes off the road, the car - who clearly doesn't check his mirrors - surprises the biker, who is sent flying over his handle bars before crashing onto the bonnet and rolling into the road. Visibly shaken the biker proceeds to the pavement to nurse his injuries, consoled by passers-by who witnessed the crash.